12:10 pm: Saratoga 2014 comes to a close today with a 10-race card including the G1 Hopeful (race 4), the G3 Saranac (race 9), and a mandatory payout of the pick-6 (races 5 through 10) pool whether or not anyone goes 6 for 6. The main track is listed as "muddy" after yesterday's downpours, with the turf rated "good." The four grass races on the card will apparently stay there, as the main-track-only entrants have been scratched from the 1st, 3rd, 6th and 9th. The Hopeful, a showdown between Saratoga Special winner I Spent It and the impressive maiden winner Competitive Edge, and the Saranac are the last of 33 graded stakes at the meeting. Todd Pletcher and Tony Dutrow have each won three of them and will face off with the two favorites in the Hopeful. 1:45 pm: We almost had a Finger Lakes special in the 2nd as 8-1 Mike Ferraro firster Sweet Sweet Afleet turned for home with a clear and windening lead but then she bolted to the outside and Brad's Ruby ($9.80) inherited the lead at the rail. Sweet Sweet Afleet straightened out, got back into it and started to gain on the new leader, but fell about a length short while clearly much the best. 2:15 pm: The Hopeful is being bet like the two-horse race it appears to be on paper, with Competitive Edge 4-5, I Spent It at 6-5 and the rest in double digits. Same in the doubles ($17 vs. $26.80, others $124 and up) and pick-3's ($101 vs. $138, $709 and up on the others. 2:30 pm: Here's the pick-6 play, which I acknowledge is odd-looking, so heavily weighted to C's that it looks like it might tip[ over. On these mandatory-payout days, I go C-heavy since 5/6 might be good enough for the front-end payout. Four logical A's and one of two wacky C's can be enough. The tradeoff for all those C's is thinning out on the main line, where I have three singles -- the Live Oak entry in the 5th,Ccarpe Diem in the 7th and Ring Weekend in the 9th. Any two of them must win for me to have a chance at 6/6. 3:10 pm: Competitive Edge ($3.30) proved best in a fast-early/slow-late Hopeful, winning a three-way duel through torrid fractions and then pulling clear through a slow final furlong. Signature Cat, I Spent It and Competitive Edge were stacked across the track in that order from the inside through a quarter in 22.64 and a half in 44.81. SIgnature Car fell back on the turn as Competitive Edge began to get clear and was in front by daylight in 1:10.20. He then needed 13.91 for his final furlong, which will raise stamina questions when he stretches out in distance. Competitive Edge, purchased in March for $750k by Nancy Favreau and Kathy Psoinos, is a son of Super Saver and the Cape Town mare Magdalena's Choice. He is trained by Todd Pletcher, who sent out Super Saver to win the 2010 Kentucky Derby. I Spent It is also from Super Saver's first crop. "It's kind of cool that Super savers ran 1-2 in the Hopeful," said Pletcher, who won his 11th Saratoga training title at this stand. Trainer Tony Dutrow and jockey Javier Castellano said that I Spnt It, who was surprisingly embroiled in the pace after winning his first two starts from off the lead, acted up in the walking ring and the starting gate. "He freaked in the gate," castellano told reporters. "He lost his mind. He broke out of the gate and he wanted to run off." 3:13 pm: Two gate scratches in the 5th: #3 Freudex and #4 Hidden Warrior. The whole field is now being backed out. 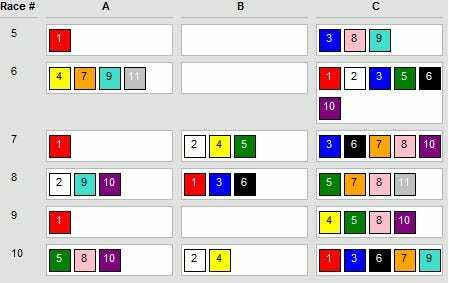 In bets where you get moved to the post-time favorite, that will be the 1 entry, now down to 2-5. 3:20 pm: An upset to start the mandatory-payout pick-6 as #9 Curious Cal ($18.40) wired the field and had no trouble holding off Readyheartandsoul, part of a 2-to-5 entry with Shimba, who ran 8th. 4:25 pm: Favorites Live in Joy ($6.30) and Carpe Diem ($3.x0) won the second and third legs of the pick-6, keeping a lot of tickets alive. Carpe Diem was yet another runninf fool of a 2-year-old for Plether. Sold for $1.6 million in March to a WinStar/Stonestreet partnership, the Giant's Causeway colt was an impressive winner going just 5.5f in his debut. He broke like a shot, dueled with third-timer Louisiana Brown in 21.88 and 44.90, then looked in deep water as 13-1 Albertrani firster Ready for Rye moved up after sitting a perfect trip behind the duel. Carpe Diem was able to find a second gear, pulled away, and won in 1:03.99. The upcoming 8th, a nine-furlong N1x on the dirt, is one of the toughest races I've seen at the meet. The public seems to agree, making 6 of the 10 entrants virtually co-favored between 9-2 and 6-1. 4:55 pm: Oh well. Thought I was in good shape with Successful Runner and Box Office tracking C J's Awesome into the far turn of the 8th. Then just as it seemed they were going to go by the leader, C J's Awesome spurted away, my two started running backwards, and they managed only 3rd and 4th behind C J's Awesome ($13.00) and Classic Sense. Congrats to commenter "kevin r," who posted the first comment on today's blog: "One bet today, #8 in the 8th." 5:35 pm: Ring Weekend ($5.10) wore down Smooth Daddy in midstretch and drew off to win the G3 Saranac, the final stakes and penultimate race of the meet. Ring Weekend has a very promising future on the grass. He was a fine second to Tourist last time out and was just as good today, relaxing in fourth place at the inside and then running down a loose leader when it was time. The Tapit gelding, who won the Tampa Bay Derby and was 5th in the Preakness earlier this year, is owned by St. Elias and West Point and is trained by Graham Motion. 6:05 pm: Capital City, beaten 21 lengths in his first start at the meet, rallied up the inside to win the finale at 13-1 and complete a $53k pick-6. That's all, folks. Belmont opens Friday; first post 1:05 pm. Thank you all for your patience as I got my feet back under me during the meet, and for all your kind comments today. I hope you enjoyed playing Saratoga and playing along as much as I did.